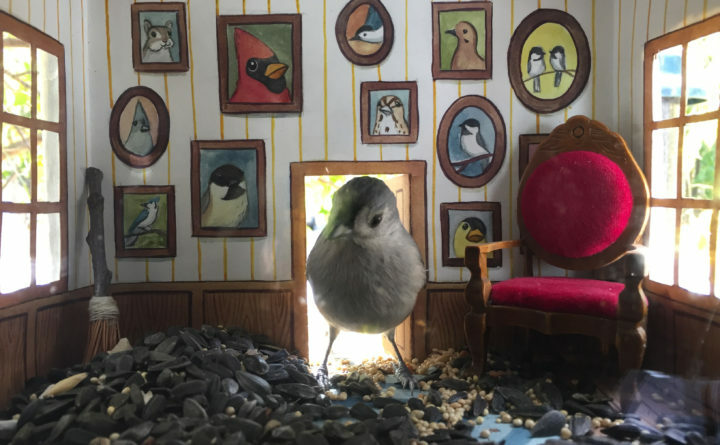 A tufted titmouse visits a cardboard birdhouse created by Jada Fitch of Addison in the fall of 2016. A miniature portrait of a bluejay in an intricate gold frame hung above a painted tile floor. A tiny bench had been placed in the corner. And through an arched doorway was a porch trimmed with a railing, a great perching spot for songbirds. 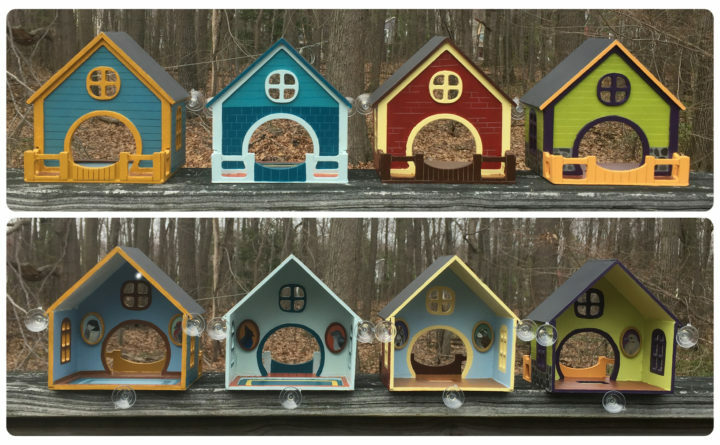 The Home Tweet Home birdhouses by Maine artist Jada Fitch are as whimsical as they are functional, and they’ve captured the imagination of people around the globe. “It gives more personality to the bird, I think, to see them in a little house,” said Fitch on a recent morning as she worked in her at-home studio in Addison. With a fine-tipped paint brush, she carefully added gray feathers to a tiny portrait of an American kestrel. A new batch of birdhouses lined the nearby shelf, ready to be decorated. 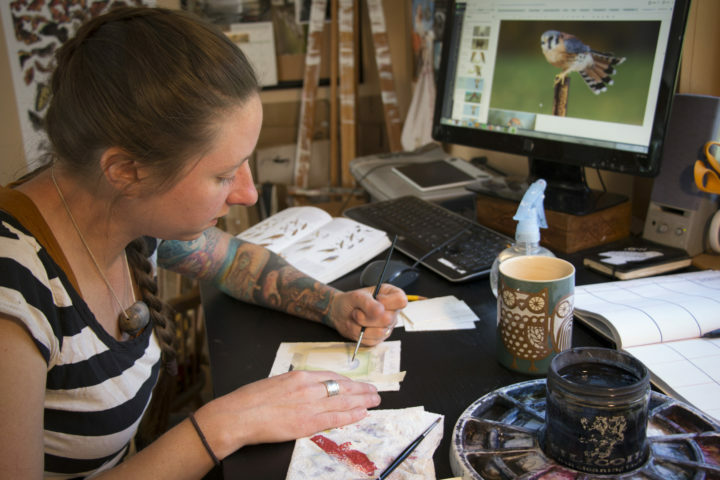 Jada Fitch paints a miniature portrait of an American Kestrel on June 15, in her at-home studio in Addison. Fitch decorates the interior walls of her Home Tweet Home birdhouses with the portraits. 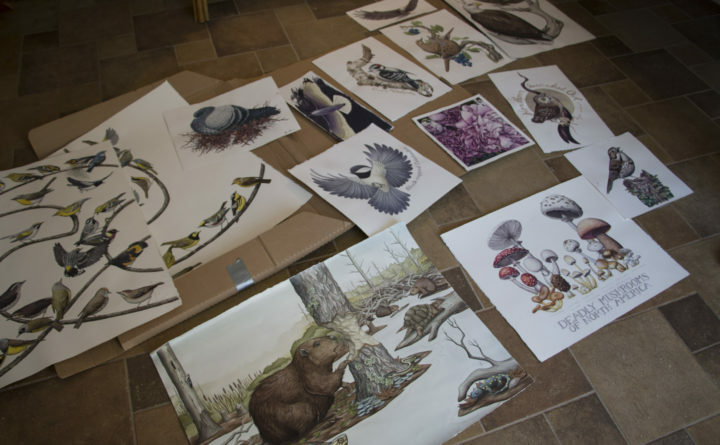 Known for her detailed and accurate wildlife illustrations and paintings, Jada Fitch, 34, has an impressive portfolio of artwork that’s been published in numerous magazines, children’s books, coloring books, posters, logos and trailside interpretive panels. She’s the illustrator of the Wildlife on the Move series of children’s books published by Yarmouth’s Islandport Press, as well as the new children’s book “ Ten Days in Acadia,” also published by Islandport. She painted detailed outdoor scenes for interpretive displays at the Scarborough Marsh and the Children’s Garden at Fort Williams in Cape Elizabeth. And she recently created the logo for the new Maine Bird Atlas. In comparison, her birdhouses are simple and barely hint at the scope of her talent as a artist. Yet they’ve attracted the attention of wildlife lovers around the world, from Maine to Australia. “I can’t quite keep up with the demand,” Fitch said. It all began with one elaborate birdhouse. 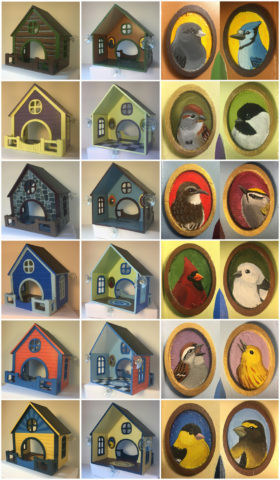 This collage shows a variety of Home Tweet Home birdhouses by artist Jada Fitch of Addison, as well as the miniature hand-painted bird portraits Fitch created to decorate the inside of the houses. In the fall of 2015, Fitch was working on an assignment to draw 100 coloring book pages, and as a break from the monotony, she decided to build a birdhouse out of cardboard. Her design left one side open so she could tape it to her window and watch the birds come and go. She then lined the interior with paper, on which she painted wallpaper, tiny bird portraits, windows, hardwood floors and an area rug. A red dollhouse armchair and a broom she created out of a twig, twine and dried pine needles added to the whimsy. And cut into the center of the back wall was a doorway for birds to enter. When she got a few good photos of birds enjoying her creation, she did what many people would do — she shared them on social media. On Reddit, a website where online content is voted up or down by viewers, a photo Fitch took of a chickadee in her birdhouse quickly rose in popularity as it received thousands of upvotes. The photo was then picked up by other big websites including Boing Boing, Daily Mail and HuffPost UK. 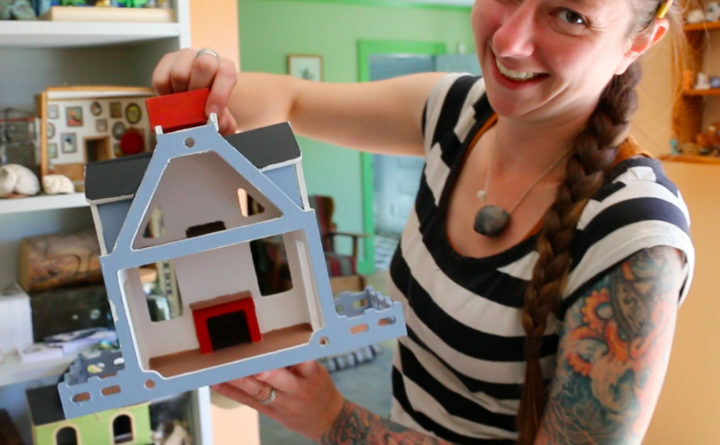 Recognizing an opportunity, she worked with her husband, Phillip Willey, an illustrator and video game designer, to design a birdhouse kit out of plastic that would hold up to the elements better than her cardboard creation. Now made out of sustainably sourced wood, Home Tweet Home birdhouses come in two models, both hand-painted and decorated with Fitch’s signature bird portraits, for $99 each. And the couple just came up with a third design, a townhouse with a chimney where you can pour seeds and nuts so they spill out of a fireplace. The houses include suction cups that make attaching it to the outside of a window easy, but they can also be suspended from a tree branch or shepherd’s hook like a typical bird feeder or birdhouse. And each house is different as Fitch experiments with painting different types of flooring, wallpaper, shingles and artwork. A recent batch of Home Tweet Home birdhouses by Jada Fitch of Addison are placed on display in her at-home studio in Addison. The birdhouses are hand-painted and decorated by Fitch. 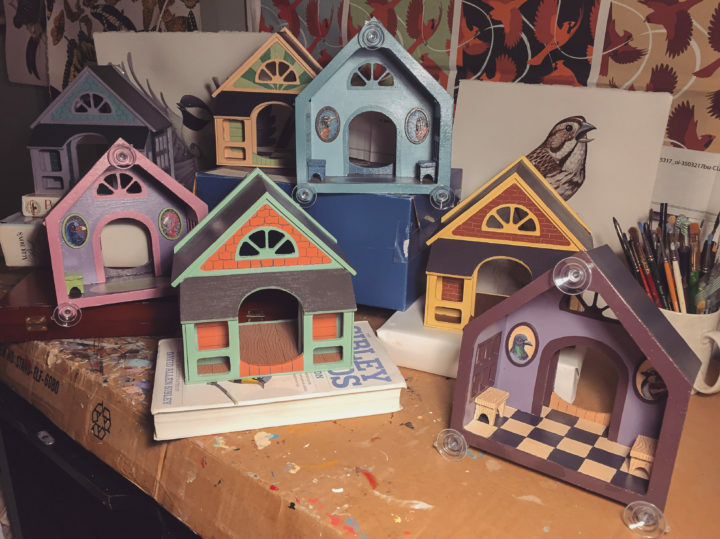 A bird lover herself, Fitch continues to create her own custom birdhouses, including a haunted house for Halloween and a fantasy house with sculpted tree roots snaking over the walls and floors. Fitch also created special birdhouses for the German magazine Süddeutschen Zeitung. The result was a multi-page article about her work in the magazine’s June 2017 issue, complete with several spreads of her custom birdhouses. “I think they hired professional birds to come in and model,” she said with a laugh. Lately Fitch has been creating the birdhouses only when she has time in between projects. She’s currently working on a book about bird anatomy and a children’s book about creatures and plants of the Maine woods. 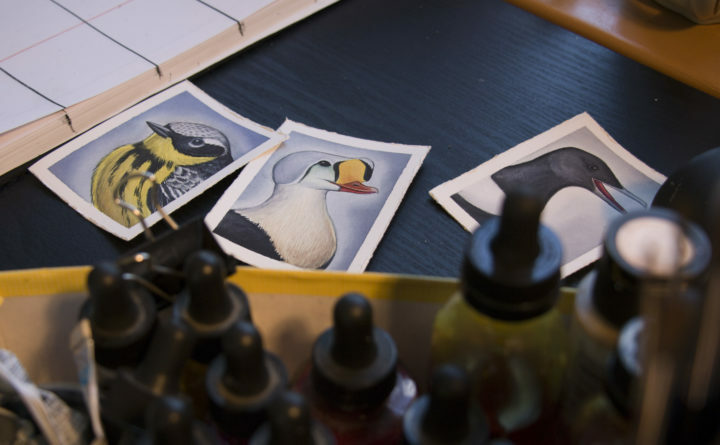 And she’s working to paint every single bird on her “life list,” the list many birders keep of the species they observe in the wild. But when she has time, she paints a batch of birdhouses and posts them for sale on her Etsy online store.